If garlic had been created in the laboratory instead of by nature, it would probably be a high­priced prescription drug. Garlic is one of the oldest known medicinal plants & it's been credited with fighting heart disease, lowering blood pressure & helping to fight off colds. Most of the modern research on garlic has concentrated on its ability to lower cholesterol & blood pressure as well as offering protection against strokes & heart disease. 1. Protection of the liver from toxic substances. 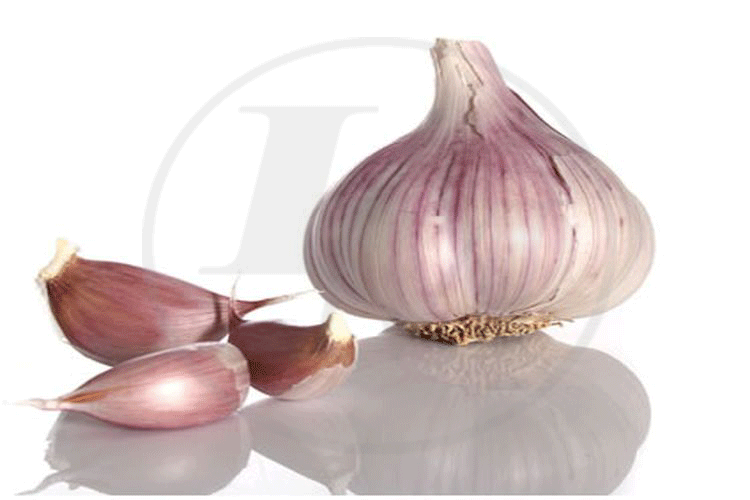 Garlic activates the cells of the liver & thereby protects the liver from toxic substances. It also rejuvenates a tired liver & promotes its normal functions. 2. Improvement of blood circulation. When Allicin, a pungent oily liquid, (C3H5S)2O, with antibacterial properties present in garlic, is heated in the process of cooking the garlic, a substance called Ajoene, a chemical compound available from garlic, Allium Sativum, is formed. This substance has a suppressive effect on thrombi & blood cholesterol, so it is effective for the treatment of atherosclerosis & thrombosis. 3. Regulation of stomach function. Allicin promotes the secretion of gastric juices by stimulating the mucous membrane of the stomach. Furthermore, it combines with proteins which can reduce excessive activity of the stomach. In addition,Aallicin reglates the functions of the stomach by activating the large intestine & thus cure both constipation & diarrhoea. 4. Promotion of insulin secretion. Allicin combines with vitamin B1, Thiamine, to activate the function of the pancreas & thus promote insulin secretion. As a result, garlic is effective in the prevention or the cure of diabetes that is caused by a lack of insulin or by defective functioning of the pancreas. 5. Normalization of blood circulation. Because it stimulates the brain nerves & controls the workings of the heart at a constant level, garlic stabilizes blood pressure. It is also capable of dissolving cholesterol & fatty substances inside blood vessels & therefore refreshing cells & the blood inside the body. • Lower total cholesterol, but raise the good­type H D L cholesterol. • Produce more “natural killer” cells in the blood that tackle infections & tumours. • Reduce the risk of blood clots that are responsible for most heart attacks & strokes. Garlic is classified as both a herb & a vegetable. It can be found in products ranging from ice cream to dry rubs. the versatility of this herb / vegetable is seemingly endless. 1. Before cooking, remove the exterior skin of the clove. There are many ways to do this. Strike the bulb with the broad side of a kitchen knife, use a rubber garlic rolling tube, soak the garlic in lukewarm water for 30 minutes or dip the cloves into boiling water for 30 seconds. 2. After skinning the garlic, select a cooking method that will result in the appropriate flavour. It can be sauted to create a nutty, savory taste, poached to create a mild flavor, oven roasted to bring out the nutty flavor with a caramelized quality, fried to create a crisp exterior or grilled to create a soft, smokey flavour. 3. Garlic is very sensitive to heat & will burn easily, especially when sautéing. Expose the garlic to heat just until the oil sizzles & then remove it. When cooking garlic with onions, start the onions first as they will take longer to cook. Indeed, the first scientific report to study garlic & cancer was performed in the 1950s. Scientists injected allicin, an active ingredient from garlic, into mice suffering from cancer. Mice receiving the injection survived more than 6 months whereas those which did not receive the injection survived only 2 months.